In this blogpost we will explore some of the characteristics and differences between the SimpleConsumer and the Default binding styles. This will be a brief overview, so not all aspects of the binding styles will be covered in this post. In order to show some of the characteristics and differences between the two binding styles we will create a dummy Fuse project. The project contains 1 Camel route and exposes this route as a REST service using CXFRS. The first thing to note is the fact we do not have any message transformations within the route. This means the request passed to the server is simply marshalled as a JSON document and returned as a response message. With our GET operation the bindingStyle does not affect the response message. So when using SimpleConsumer or Default binding style, the response message is the same. This is because of two reasons: first both the default and SimpleConsumer binding styles the Camel message is populated with the raw CXFRS message, an object of type MessageContentsList. This is the behaviour of the Default binding style. However, the SimpleConsumer looks at the method signature of the method in the Endpoint class. When a single object can be identified as the body the Camel Message will be populated with this particular object. When a sigle object cannot be identified as the body the original MessageContentsList is used as the body in the Camel message. Since our GET operation uses two pathParam arguments the SimpleConsumer binding cannot decide which one of them is the body and defaults to the MessageContentsList object. Another thing to note is the fact the standard Camel Type converters can handle the MessageContentsList object type and marshal it to a JSON object without any trouble or configuration. Binary @Multipart body parts become IN message attachments, supporting DataHandler, InputStream, DataSource and CXF’s Attachment class. If the message body type is different to javax.ws.rs.core.Response (user-built response), a new Response is created and the message body is set as the entity (so long it’s not null). The response status code is taken from the Exchange.HTTP_RESPONSE_CODE header, or defaults to 200 OK if not present. This means the path parameters in our request are accessible as Camel headers on the exchange. In our simple example using a GET with just two path parameters it might seem a bit trivial to use the SimpleConsumer binding over the Default. However when method signatures become more complex the SimpleConsumer binding provides very usefull functionality and can save time mapping the CXFRS MessageContentsList message manually. The Default binding is, as the name suggests, the default J so no additional configuration on the component is required. However to be more verbose, one can add the bindingStyle=Default to the URI. The Default binding style always populates the Camel message body with the CXFRS MessageContentsList object. As we have seen above we can use the Camel Simple list expressions to retrieve values from this MessageContentsList. And this can be a quick way to access values where the options are limited. However, when using more complex method signatures in your CXFRS methods this can become quite cumbersome. Especially when the values in the method signature are more exotic Java Objects. The most common way for using the Default binding is to implement a custom Camel processor to perform the mapping manually. As mentioned above when using a very simplistic call containing only two path parameters handling the CXFRS message is quite simple using Camel, regardless of the binding type used. However when dealing with more complex scenarios the SimpleConsumer definitely can save time and effort. When we add a POST method to our Endpoint class and add the request message to the signature the SimpleConsumer maps the request body in the POST to the Camel message body. 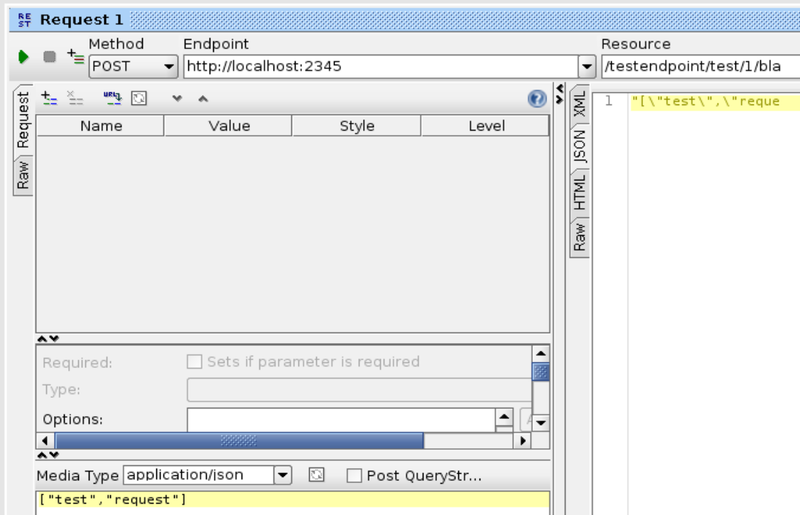 Note the String request parameter in our doPost method. As we can see the SimpleConsumer adds all http headers to the Camel headers, but also creates Camel exchange headers for the PathParam parameters we defined in our method signature (displayed in bold). The SimpleConsumer binding style provides a lot of ease when consuming REST messages from Camel and can be a real time saver. Especially when dealing with (even slightly) more complex REST messages.